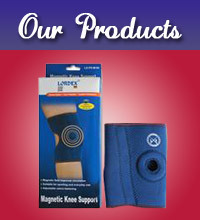 Lordex Gallery Trading L.L.C Sportswear is a wholesale and retailer distributor of all kind of Fitness Apparel -such as Magnetic knee support - Magnetic Ankle support - Magnetic Calf support - Magnetic Elbow support- Magnetic waist belt . Lordex Gallery trading has a big collection of Mountain Bags. These Mountain Bags have large main top load compartment. Sternum strap and adjustable padded nylon hip belt with quick-release buckles. Adjustable padded back support with contoured padded shoulder straps. Two zippered and two elastic mesh side pockets. Our Mountain Bags are of Gray/Black color combination. The goal of Lordex Gallery is to provide an extensive product line at competitive prices.